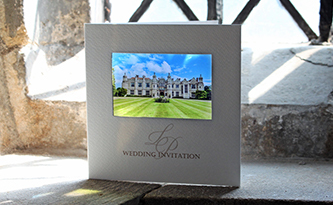 These are some fabulous invites we did recently for Hengrave Hall, Bury St. Edmunds. It’s a fabulous venue for weddings and has its own chapel. We created these stunning wedding invites and they had a lot of evening guests too so we created a more simplistic coordinating card with a sketch of the venue all to match. We have added a watermark monogram for this couple and it appeared on all their stationery.